Hi there! Thank you for visiting my blog today! I am super excited to show you my latest creation. 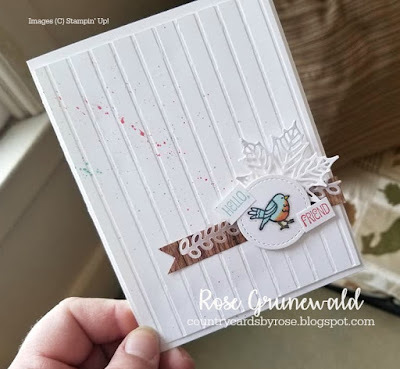 This card might be one of my favorite cards I have ever made...I just love it! As I've been experimenting in my craft room, I've made a lot of white on white cards lately. I love the crisp, clean look of that palette. I used my new Simple Stripes embossing folder to add some texture and a strip of Wood Texture DSP for a pop of color. The wood grain is very striking against the crisp white, don't you think? I softened the contrast with the vine die cut from the Little Loves Framelits in Vellum. 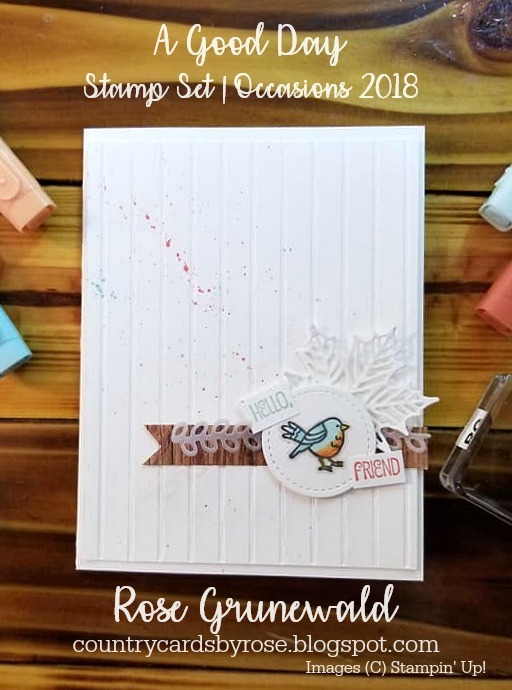 I also got to use my Stampin' Blends markers on this card - I used light and dark Pool Party, light and dark Calypso Coral for the bird, and I outlined the bird very carefully with light Crumb Cake to add some depth and contrast. They were perfect for coloring that little bird - isn't he adorable? I cut around him with the smallest stitched shape circle framelit and popped him up on dimensionals. 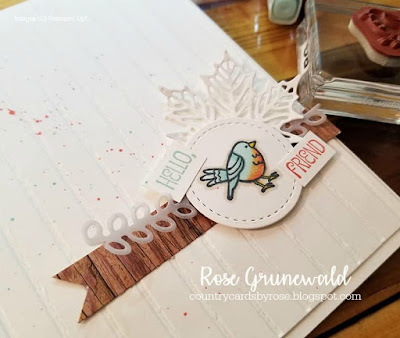 The "hello friend" sentiment is stamped in Pool Party and Calypso Coral - just like I used on the bird. I snipped the sentiment apart so I could place the pieces where I wanted. Finally, I tucked the white maple leaf from the Seasonal Layers thinlets behind the bird and sentiment. 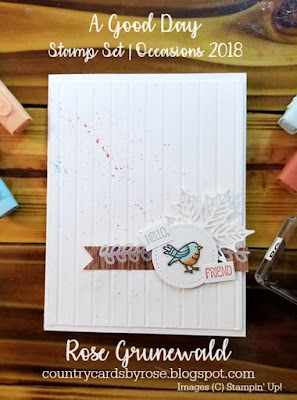 As a finishing touch, I flicked some ink across the card with my Calypso Coral and Pool Party Stampin' Write markers. I just love those little splashes of color.